OTTAWA — Craig Anderson made 38 saves and Bobby Ryan continued to have a hot hand in the shootout to help the Ottawa Senators to a 2-1 shootout victory against the Buffalo Sabres at Canadian Tire Centre on Tuesday. 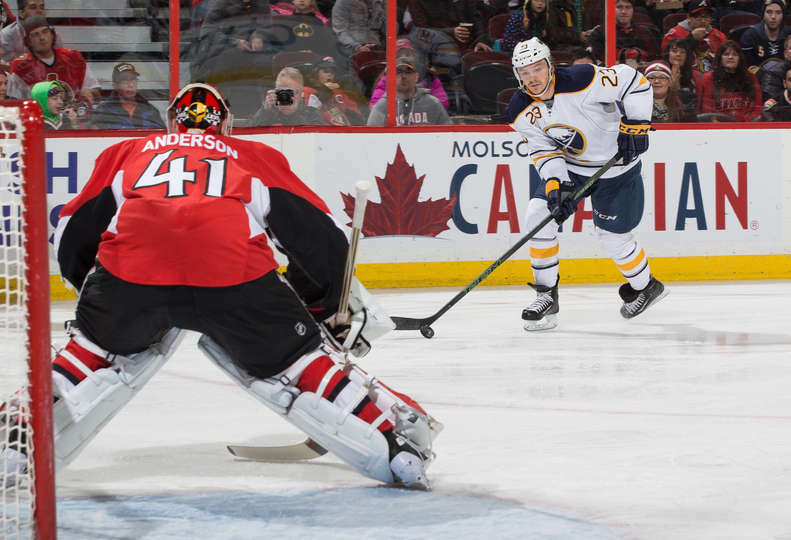 Anderson denied Jack Eichel and Matt Moulson to help the Senators (26-26-6) end a three-game losing streak. Ryan scored in the shootout for an NHL-leading sixth time this season (on eight attempts). “Right now, 1-on-1 situations, I’m pretty comfortable,” Ryan said. Kyle Turris also scored against Sabres goaltender Robin Lehner in the shootout and Ryan Dzingel got his first NHL goal for the Senators in regulation. Moulson scored his first goal since Nov. 1 and Lehner made 25 saves for Buffalo (23-28-7). The Sabres played without forward Evander Kane, who was suspended one game by the team for missing practice Monday after attending the NBA All-Star Game in Toronto on Sunday. Kane has five goals in his past six games. The Senators aren’t in a comfortable spot; they’re six points from the second wild card into the Stanley Cup Playoffs from the Eastern Conference. But Ryan said the win was a big boost. The Sabres haven’t scored a goal in the shootout since October; they have been denied on 14 attempts since. Buffalo is 1-5 in the shootout this season. Eichel had a great chance to win it with 17 seconds left in overtime, but Anderson made a save. Eichel, the Sabres’ first-round pick (No. 2) at the 2015 NHL Draft, took responsibility for the loss. Dzingel, a rookie who played well enough to get shifts in overtime, tied it 1-1 at 7:10 of the first period when he stuck with a loose puck that was bouncing around between the skates of Sabres forward Marcus Foligno in front of the Buffalo net. Senators defenseman Patrick Wiercioch tried to pass the puck to Dzingel poised just on the edge of the crease to Lehner’s left. The pass got caught up in Foligno’s skates and Dzingel took a couple of whacks at it before it got past Lehner. Moulson scored his first goal in 44 games when he took a sharp backhand pass from Eichel that found Moulson in front of the net. There was confusion among Senators defenders Curtis Lazar, Dion Phaneuf and Erik Karlsson, and Moulson was alone to score his fourth goal of the season at 6:01. It was the 39th time in 58 games the Senators had given up the first goal, but Senators coach Dave Cameron said he was proud of the way his players kept grinding. Anderson made two good saves during a slashing penalty to Senators forward Mark Stone in the second period to keep the game tied 1-1. Anderson made a pad save against Sabres forward Jamie McGinn, then stood his ground to deny Mark Pysyk. Each goaltender made big saves in overtime. Lehner caught a Karlsson one-timer off a 2-on-1 with Dzingel in the second minute; Anderson stopped Eichel on that breakaway.